« In remeberance of Clément Méric: Fight for a fortunate future! Never forget the victims of police violence : Remember Halim Dener! 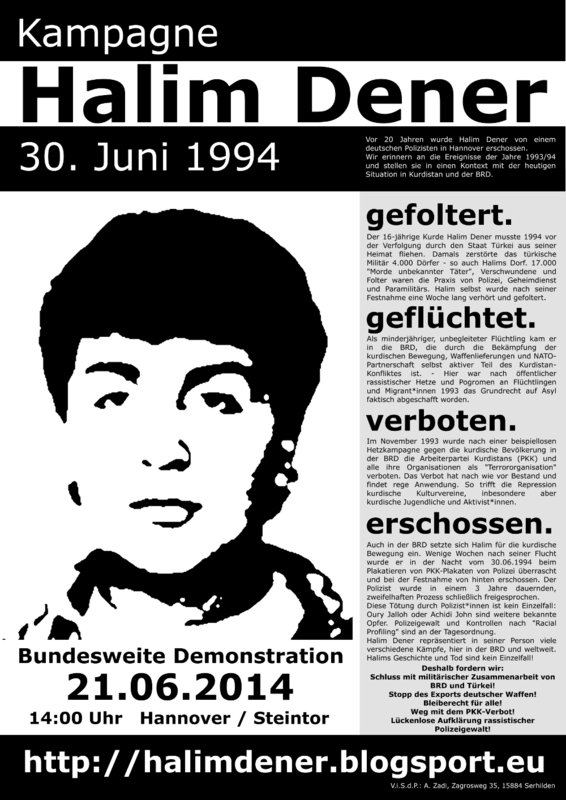 We support the nationwide demonstration in remembrance of the 16 years old kurdish refugee Halim Dener, who was killed by the german police in 1994 while pasting posters with the symbol of the criminalised kurdish liberation organisation ERNK. 20 years later many antifascist, leftist and kurdish groups call to the streets of Hanover on June 21st 2014 to make a stand against police violence, the european racist regime, state repression and the continuing prohibition of the PKK, which actually means the oppression of every kind of political activity of our kurdish comrades. In the case of Halim it was even deadly. There are organised journeys from different german cities, so there’s no reason left not to show up overthere because … REMEMBERING MEANS FIGHTING!